From Shing Mun Reservoir, Hong Kong. The structure in this photo, which is a circular waterfall, is actually a bellmouth overflow of the reservoir. 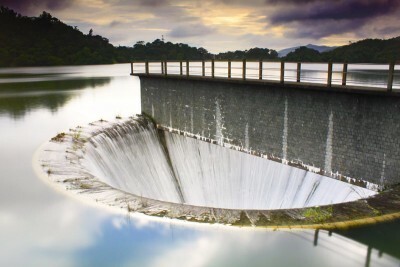 When the reservoir overflows, which is the case in this year in Hong Kong as there are so many rainy days in this summer, the excessive water would then pass through this structure to the Lower Shing Mun Reservoir. It is a must-see item in Shing Mun Reservoir, and could only be seen after great rainfall. Another scene which is famous in Shing Mun Reservoir is so called “Forest in the Sea”.